Quick release food carriage bar; food tray is completely removable for an easy and thorough cleaning in the sink! Todays consumers want to know what they are eating, and the CuisinartTM Professional Meat Grinder lets them make healthy choices. Large die-cast metal hopper and a powerful motor lets you grind generous portions of fresh meats quickly and easily. Transform your KitchenAid<sup></sup> Stand Mixer into a versatile food grinder that uses the power of the motor to help you tackle a variety of tasks. The coarse grinding plate is great for grinding raw meats for burgers or meatloaf and combining ingredients for homemade salsa, while the fine grinding plate quickly grates hard cheeses and helps you make bread crumbs. Professional Style Food Slicer in Silver Stop paying extra for pre-sliced food! 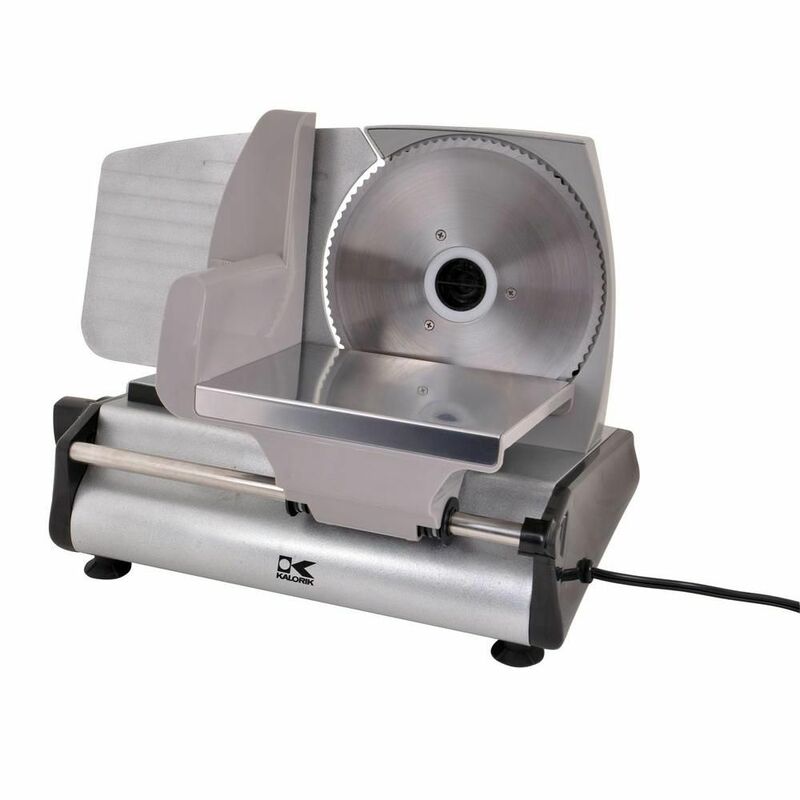 Slice your own meat, cheese, bread, vegetables, and fruit quickly and easily with this high-quality slicer from Kalorik. This stylish aluminum housed slicer features a specialized curve design for ease of slice removal as well as space to catch and organize your cuts. Our professional-style precise thickness control knob makes selecting your cut thickness simple and easy, up to 9/16 (15mm). The large multipurpose 7 1/2 inch serrated stainless steel blade handles a wide range of food sizes and types and is easily removable without the use of any tools for cleaning and storage. In addition, the quick release food carriage bar enables overall cleaning by hand or in the sink! Other highlights include; non-slip suction feet, and a strong, high-quality 180 watt AC motor. Professional Style Food Slicer in Silver is rated 4.4 out of 5 by 22. Rated 5 out of 5 by Pam from Just love it! So happy I bought it! Just love it! So happy I bought it! Rated 5 out of 5 by Richard from It’s what I hoped it would be. A home use... It’s what I hoped it would be. A home use slicer but with a very nice smooth thickness adjust. It cleans up easily too. I would recommend this. Rated 4 out of 5 by Marlene from I LOVE this food slicer. I have had it... I LOVE this food slicer. I have had it about three to four weeks now and have already used it about four times. I have sliced roasts for jerky and veggies. It's great for home use. I read a LOT of reviews for different slicers and came back to this one. It had great reviews and it is so easy to use and clean. Simple, simple! I bought one for my parents for Christmas as well and can't wait to give it to them. I would recommend this to anyone!! Guess the only reason I didn't give it an Excellent is because I wish it had more stainless on it. Rated 4 out of 5 by Sharon from Excellent product I bought it 2 months ago and very happy for its lightweight, essy to clean and I use it for meat and vegetables.